Often times we stop ourselves from sharing something because we are certain that no one else will be able to relate. That the thoughts that continue to loop in our heads are outdated, “I should be past this,” I say, for what feels like the hundredth time. Maybe it’s a way to protect ourselves, to keep within the walls of the stories that we’ve told ourselves—the things we think we can or cannot do based off of past experiences, set backs, losses, fear, and pain. And often what pulls out of one story and into another is a complete and total breakdown. A moment when everything that has been suppressed and ignored is now at the surface, making the option to ignore it completely out of the question. Uncomfortable, anxious, and for the first time in awhile, we are seen entirely, as if taking a step back from ourselves and looking back on, wondering how in the world we’re going to be able to move forward without falling apart again and again. There’s never any guarantee that we won’t. That things won’t fall to pieces again, but as soon as that shift takes place, even if small, we have no other choice than to grab hold of that story we’ve been telling ourselves, and shake it. Shake it until everything falls to the ground, and we are having to pick up each moment, feeling, and anxious thought, one by one, while leaving what is no longer needed behind. Or something like that anyway, as how each of us interprets a story, this story, is going to be entirely different. Not just that, but if I were to read this a year from now, there’s no question I would read it differently. That my take-aways would change, realizing, slowly, and with consistent reminders, that we are all in this together, and even if unbearably uncomfortable, we have the ability and capacity to step into the shoes of another. Leading, over and over again, into a place of compassion and understanding for all we may never understand. For the story that has no beginning or end. I am here, again, with an enervating ache in my chest. Sipping air, careful not to choke on the Asian Pacific humidity, as fears of another health issue leave me scanning for the mercy of kind, accepting eyes. Instead, I find judgment in my own pupils. They burn holes through the mirror as I ask—audibly, yet rhetorically—“I thought we were past all this?” Over the part where I doubted my body’s intelligence and its inherent need for rest. Over the part where I let my fears run the show and juggle worst-case scenarios in my head like circus balls. It was week two of my yoga teacher training in Chiang Mai, Thailand, and I was unraveling. I had come here with high expectations (and equally high anxiety): Return to the place where Lyme ripped my life apart several years earlier—and prove to myself how far I’d come. How much I’d grown. How deeply I had healed. I was revisiting the scene of the crime, the place where I had fallen in love with who I was as a traveler, a humanitarian, a free spirit—then promptly kicked out of that girl’s world to manage my illness. But, hey, I was different now. Stronger. Wiser. More resilient and aware. According to my doctors, the pathogens were out of my system. And based on how I felt, I too believed that I was healthy. I had finally overcome the battle with Lyme, and I was ready to continue my life. So, WTF was I freaking out about? Having discovered yoga in the darkness of dis-ease, I gravitated towards a very slow practice. Since I wasn’t physically capable of much more than breathing and rolling around on a mat, I sought out prenatal classes and retreats that drew an older crowd such as Yoga for Healthy Aging and Gentle is the New Advanced at the famous Feathered Pipe Ranch. I came to believe that yoga had to be gentle to be “real,” and that the inversions, binds and sweat-inducing pictures splattered across Instagram were creating unattainable expectations for “those of us” searching for true acceptance within ourselves (as if this wasn’t every human on earth). I avoided power yoga like the plague. Still, I was on a journey of self-discovery, and I decided to pursue my teacher training at Pranaya Yoga, hoping to deepen my own understanding of the practice, while learning how to teach an accessible, inclusive style that resonated with me. Well, as they say: Be careful what you wish for. Within the first week, I was introduced to a wide variety of asana styles, causing an internal war to erupt. Vinyasa, hatha, anusara, yin, Iyengar, ashtanga, restorative—I got glimpses of it all from the program’s four instructors, each of whom specialized in a different area of yogic study. For seven hours a day, we dove into a combination of asana, anatomy, philosophy, history, meditation, Ayurveda, sequencing, psychology, neurobiology, conscious communication and voice activation. Each day, I was invited to expand my comfort zone—the wall I had built around myself during my healing. The gates I designed to let just the right amount of growth in then promptly closed as soon as I felt discomfort. Here, there was no hiding. I was being asked to swing open these doors, walk full steam ahead and embrace new ideas and ways of viewing my body—not to mention the narratives that I constructed to keep my life safe and intact. “This is not the kind of yoga I want to teach,” rang in my head some days. Until now, every sensation of soreness or fatigue I experienced sent me into a spiral of insecurity. Over and over, I re-lived the days when I was really struggling, feeding off the past through a concentrated concoction of muscle memory and trapped emotions. When I felt my shoulder pinch in Chaturunga, I remembered crying in the shower, unable to lift my arms long enough to shampoo my hair without collapsing into the tub below. When I felt my lower back compress in Ustrasana, my mind was flooded with memories of physical therapy clinics and days spent lying in bed writhing in pain, changing my posture to prevent the stabbing sensations in my lumbar and thoracic spine. I rarely ever envisioned my body pain-free. In a later asana class, we were asked to come into thread-the-needle pose, a position meant to open the backside of the shoulder. With my hips high in the air and knees on the ground, I pressed my right cheek against the mat, tucking my head to avoid the shoulder stretch—as I always did. I was visibly uncomfortable, unable to allow myself to relax. Rosemary Bolivar, the studio owner and one of my beloved teachers, rubbed her hands together to generate heat, then gently shifted my head so that it was aligned with the rest of my spine. She placed her hands on my shoulder and synchronized her breath with mine, as the warmth and weight of her palms guided me deeper into the stretch. Within seconds of exhaling, I felt an overwhelming rush of emotions. As I released the tension, a surge of energy released with it, leaving me in tears on my mat. Tears of relief and disbelief alike. I began to grasp—perhaps for the first time with such clarity—the extraordinary complexity of dis-ease. How deeply trauma affects not only our physical bodies, but the ways in which we relate to the world and how our brains process information on a daily basis. These memories were lodged in my tissues, and my mind was stuck on a merry-go-round, believing its job was to protect me from my own healing. As I challenged my body, the emotions resurfaced, and I experienced them with a new sense of intimacy, a relationship based in both acceptance and nonattachment. Reviewing and releasing the trauma felt like drawing out venom—a slow, arduous process, yet necessary to my survival. Throughout the next five weeks, Gernot Huber helped me cultivate spaciousness and joy in my practice, while Laurence Gilliot held meditations, voice sessions and sharing circles that allowed me to move through my challenges. With support and guidance from my teachers and 11 other amazing women from all over the world, I slowly uncoiled, emerging from my cocoon a little more each day. I explored parts of my self that I had become an expert at avoiding. I delivered love to the corners of my bones that had been laced in yellow tape and caution signs. I slowly began to write a new narrative about everyday life in this skin. I asked a lot of questions: Can I find the sweet spot between challenge and complacency? Can I give my experiences proper reverence, without building my identity around them? Can I feel the emotions and let them go, without marrying the memory? Part of me thinks that somehow this approach isn’t doing my life justice, like I’m forgetting how far I’ve come. Another part knows that idea is attachment at its finest. Teacher training ended much differently than it began. I learned that I am always discovering who and what and how I am. That we can, in fact, have these kinds of transformative experiences on a regular basis, especially through practices that invite us to revisit our truths time and time again. That because of my own adventures in healing—not in spite of them—I’m qualified to help others embark on the journeys back to themselves. Lyme happened—and it changed me. Yoga happened—and it, too, is changing me. Every day I’m working on moving forward, and as I write this, I don’t know exactly what that looks like. Perhaps it’s the practice of thanking experiences as I process them, knowing they’ll always be a step on this path. Letting go of the desire to lead with this story of struggle. Forgetting the word “still.” Realizing that “real” yoga is any practice that allows us to take a deeper look at the complexities and hypocrisies and magical molecules that make us human. Recognizing that all of this belongs in the beautiful circle that makes up a life. Knowing, deep in my bones, that there’s no real end to this story—and writing it anyway. wanderer and holistic health enthusiast. 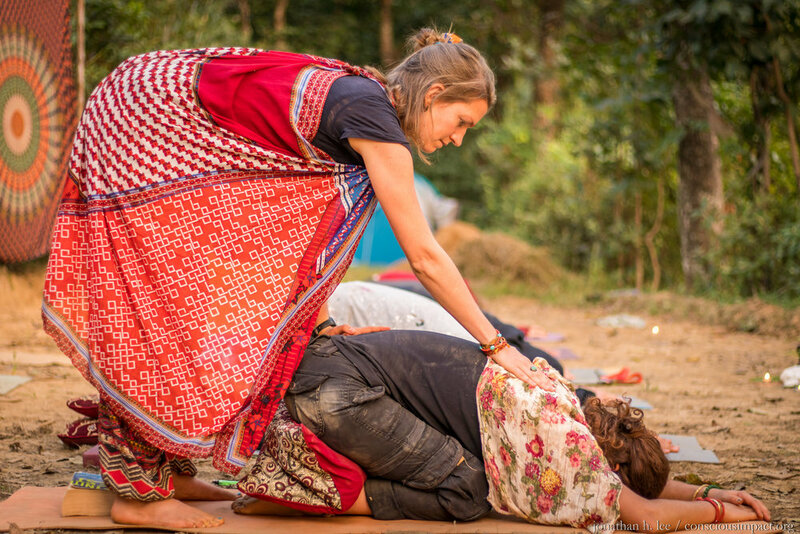 She recently returned to the States from a four-month solo trip to Thailand, Nepal and Bali, where she studied and taught yoga, lived and volunteered in community, and continued to deepen her connection to herself and the earth. Here are ways you can continue to keep in touch with her happenings, adventures, yoga practice, writings, and so much more. Photos Credits: Jonathan H. Lee / Subtledream Photography & Marguerite Goguely.